Jerry Horne wrote: Mark mentioned Lana and Miss TP at his NY appearance. Hm. That seems odd. But the book does not mention that at all. Perhaps he just misspoke? He mentioned it at least twice. I would think the fact that he said it and it's not in the book makes it a clue that Frost is putting out there. Agreed. I think its a deliberate clue. Someone needs to get this on video or audio somewhere. I want to add it to my sheet because I feel it's important but I want citeable proof of the quote. Hopefully someone will- if he indeed continues to say this at signings. In the second part of the Andrew Packard story, Cooper clearly states that Josie shot him after killing Jonathan in Seattle. The hell? LonelySoul wrote: Can anyone identify what the stamp says in the upper right of Norma's postcard to her parents? This is version of the postcard shown in the July trailer, not the moon landing version we actually see in the book. 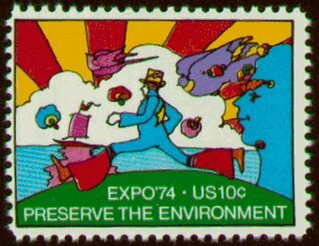 The colors are a bit off (probably just faded), but I'm betting it is the stamp for Expo '74, an environmentally themed world's fair held in Spokane in 1974. The effect is still the same - a well-known stamp that is clearly from the future. Posted this on another board as well, but it drove me bonkers. I can take small inconsistencies with the show and even the occasional historical slip-up. But there's one character - Robert Jacoby - who is literally all over the place, in a fashion that renders him almost nonsensical. - Robert Jacoby writes an article about Margaret's third grade disappearance in 1947 but later he says he met her in the third grade, strongly suggesting they were classmates, which would make him nine when he wrote that '47 article. - He says after the war he returned to Honolulu for the last semester of his senior year, implying he was 18 around 1945/46, meaning he was born in the late 20s (and would be about twelve years older than Margaret). - He says he came back to Twin Peaks five years AFTER the war which means he wasn't there when he wrote the 1947 article for the Twin Peaks Gazette! - The funeral card confirms that Robert died in 1986, and lists his birth year as 1931, simultaneously making him too young for his wartime chronology (unless he graduated high school at fourteen or fifteen) and way too old to be Margaret's classmate. I can overlook some slippage here or there but this was so glaring and distracting - like I said some of these contradictions were within paragraphs of one another! In a book that has carefully stuck to a historical throughline we are suddenly confronted with a timeline in which 1947 is before World War II, a newspaper editor dies twice, and a sixteen-year-old writes a news article about his nine-year-old classmate while simultaneously attending third grade in Twin Peaks and college during a five-year period in which he isn't in Twin Peaks. Unless there are different-aged doppelgängers or alternate universes involved here (which can't even explain all the discrepancies, especially within a single article), my only explanation is that Robert's memory was slipping in a major way during his last few days AND the archivist incorrectly stated that Doug took over the paper when Robert died - maybe he was just ill and retained an honorary byline till his death. Thanks, NewShoes! Buy you a Coke? LostInTheMovies wrote: Posted this on another board as well, but it drove me bonkers. I can take small inconsistencies with the show and even the occasional historical slip-up. But there's one character - Robert Jacoby - who is literally all over the place, in a fashion that renders him almost nonsensical. This makes me think two contradictory things: 1) This shows that he was already consciously trying to come up with a chronological discrepency, and decided to go with something more subtle, 2) he picked that stamp, noticed that it was 5 years ahead of time and though "I'll go with something from '69"...and still ended up with a wrong date lol. I can't help but think that we have one Weirdly Disapparating Sibling (confirmed as an intended plot point), one Weirdly Apparating Sibling (with more time paradoxes following him than an entire season of Doctor Who)... ...and Frank. This may not mean anything, especially for Frank, but Pete Dayton also had a weirdly apparating family, especially in the script. 1. Annie. It seems with the re-imagining of Norma's mother as someone completely different, and with no mention of Annie anywhere in the dossier, though she was clearly a central figure to the going-ons with Cooper, Miss Twin Peaks, Windom Earle and the Glastonberry Grove bit at the end of S2, that they are trying to erase this character's very existence. The dossier seems to go out of its way to not include her - as clearly the whole reason for Harry and Coop going to Glastonberry Grove was to rescue her. 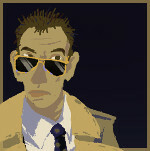 Surely Major Briggs heard about this, and not just that Harry and Coop went to Glastonberry for reasons unknown. The town knew Annie was kidnapped by Earle, right? 2. Earle. His mention is very brief although he was a major presence in the Lodge happenings at the end of S2, as well I'd imagine he knows all about the various government cover=ups and was possibly even involved in them. 3. Audrey's letter to Ben before the bank explosion is re-writing both of those characters' development up to that point. It seems to be reverting them back to their Season 1 characters. Audrey was actually protesting at the bank on behalf of Ben, not because of him. There is more, but these are the three things that bothered me the most. I know, I shouldn't be complaining at all because who knew we'd have new Twin Peaks material at all? But I really hope these inconsistencies are on purpose and not oversights. And I really hope they aren't going to try to erase Annie. Wow, BOB, wow! Read through the book spoilers thread. These are the exact things we've been debating there. Two twin peaks, two worlds, two lodges. Could the waiting room be the pathway between both? Perhaps the black lodge and the white lodge are not rooms but two different versions of the world, seperated by a catastrophic event. Burroughs always believed that the atom bomb eviscerated people's souls, and he invented the lodges (and he was due to play Dwayne milford). I wouldn't be surprised if this dossier is garland Briggs attempt to work out where the two worlds split, using contradicting documents either found or collected from the black and white lodges, and attempting to find chronology.